‘Does anyone play any games? Real life, not computer games. He was quite stunned by the large number of responses that he received and the amount of different games that people wanted to play. What followed were many journeys across the length and breadth of the UK where he indulged himself playing some well loved games as well as learning some new ones, and also meeting some weird, wonderful and fanatical (about games) people on his travels and enjoying visiting lots of different cities. All of these are chronicled in this immensely enjoyable and amusing book. In Dave Gorman Vs. The Rest of the World, he ends up playing some very well known and much loved games such as Cluedo, Cribbage, Subbuteo and Guess Who. One lady even invited him to play Rod Hull’s Emu Game – a game that somehow escaped my attention when it was first brought out. Many of the games were great for a nostalgic walk down the memory lane of childhood – that is if you are of a certain age of course! Others were entirely new to me such as Khet, Kubb and Bluke. If you like playing games, this book could certainly inspire you to try and one or two new ones. However, as Dave gives his verdict on each ones, they don’t all get thumbs up recommendations! There are also some quite dodgy escapades written about in Dave Gorman Vs. The Rest of the World. These include visiting a lady who makes him have a shower and then she takes his clothes away to wash; having to hide in an attic when his Subbuteo opponent’s wife arrives home unexpectedly; and being punched on the nose by a religious enthusiast who doesn’t like Dave’s views. This episode should serve as a very important warning – never accept a game invitation with a stranger if you don’t know what the rules are! I bet you don’t know what the rules to IDVE are either! 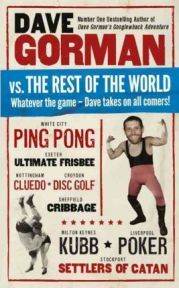 Dave Gorman Vs. The Rest of the World has a laid back chatty style which feels like He is confiding just in you. I really enjoyed the way that the book was written as well as the crazy idea behind it. There are also lots of very funny footnotes that also add to the overall comical effect. I love the fact that the book is about more than just the games and there are a hugely diverse set of people to read about. The book also appeals to my competitive nature because, as far as Dave is concerned, it’s all about winning. He even goes so far as keeping an ongoing scorecard between himself and the rest of the world, which is regularly updated. You’ll have to read the book to discover who wins though and what the final score is. Overall, Dave Gorman Vs. The Rest of the World is a hugely entertaining book and will certainly appeal to people who enjoy the Dave Gorman brand of humour. I definitely recommend it. No Comments on "Dave Gorman Vs. The Rest of the World"